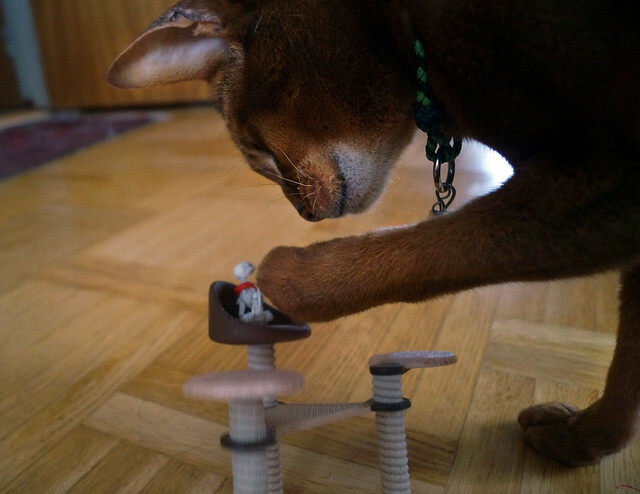 As my regular readers know, I am a big fan of Lisa Larson, especially her cats. 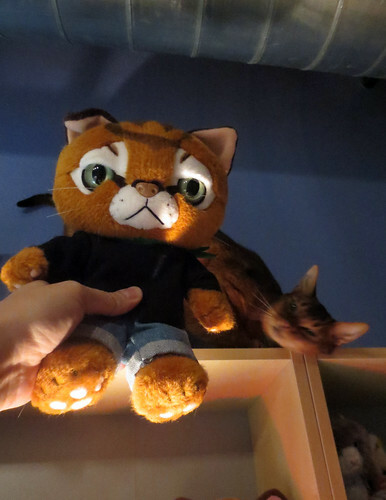 So, for my birthday, Björn managed to find me a Japanese Lisa Larson plush Rudolf! 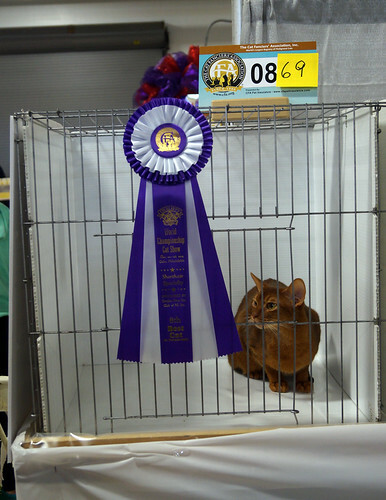 I joke that it is clearly an Abyssinian; he’s brown, with clear banding. Lorelai can’t quite decide how she feels about Rudolf. 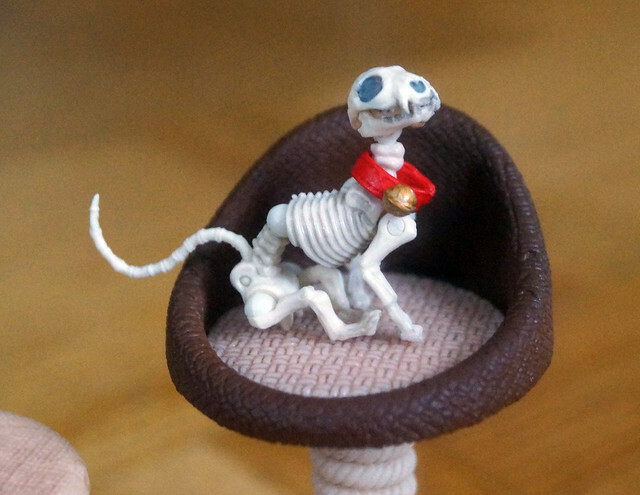 It’s a funny thing, the way the Japanese have embraced Lisa Larson’s cats, and yet it isn’t at all. They have co-opted Finland’s Moomins to the point where I legit thought Moomins were Japanese before Sanna-Leena set me straight. 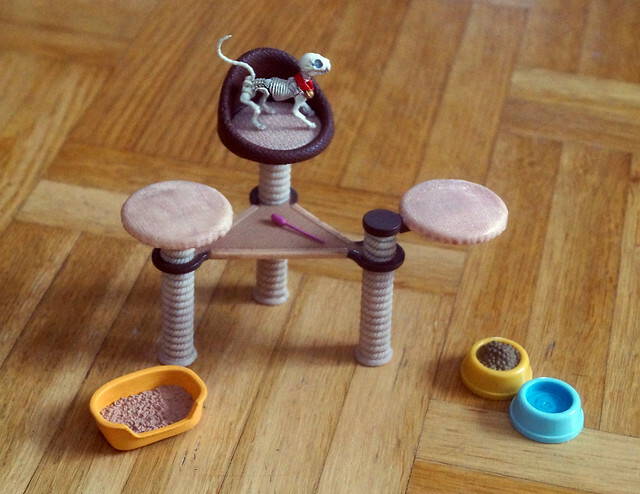 But the Lisa Larson obsession, especially her cats, makes complete sense. Lisa’s round, friendly cat faces are right up Japan’s alley. A match made in heaven, one might say. 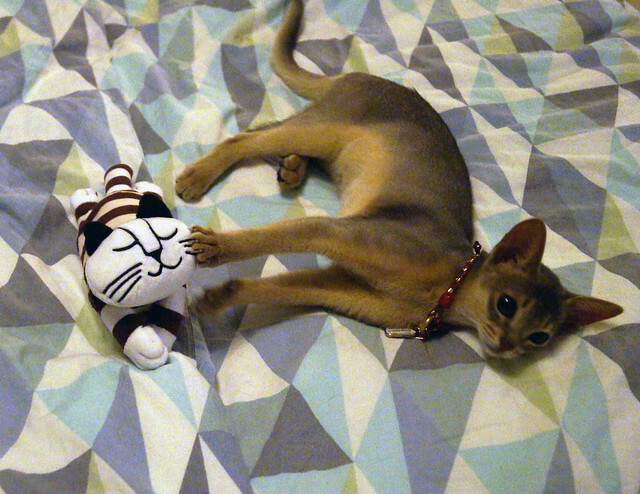 Don’t worry…no Lisa Larson Japanese cat plushies were harmed in the making of this post. It occurred to me that I never finished sharing photos from the World Show in Philadelphia, which Jacoby and I entered last November. 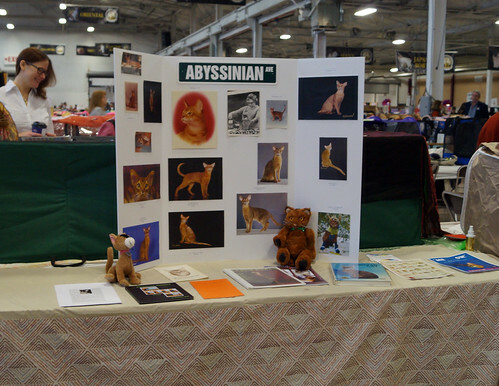 There was a good showing of Abyssinians at the show, representing all four colours. 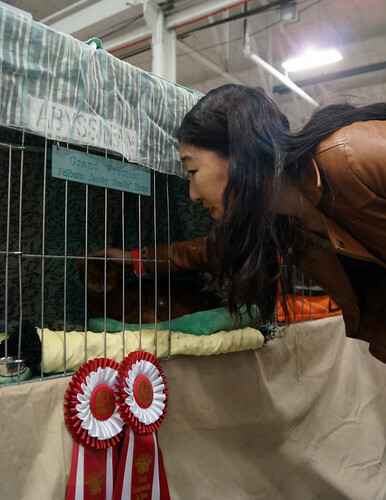 There were a couple of other Abys, like Racy Mooner and her mother, Twyla, who were at the show but who weren’t actually entered in competition. 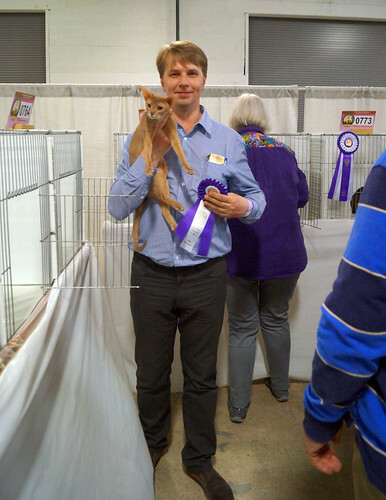 Also present was the 2012-13 CFA show season’s Best Cat in Premiership GP, NW Zhender’s Roger Vivier of NuDawnz. I forgot to take a photo of him (despite his being benched just behind the Aby breed booth), but I did get his card. 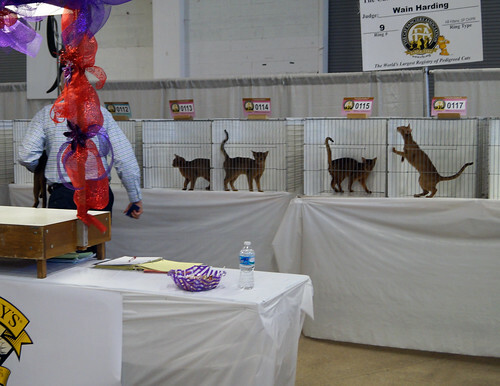 There were a LOT of Aby kittens entered – Five were entered in the Red Show, and four were in the Purple Show. 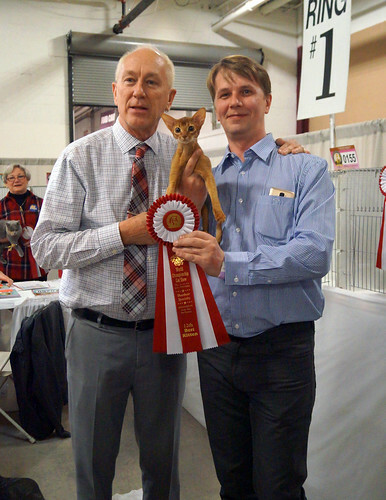 One of the kittens in the Red Show was Vasil’s little red girl, Greenville Deja Vu. 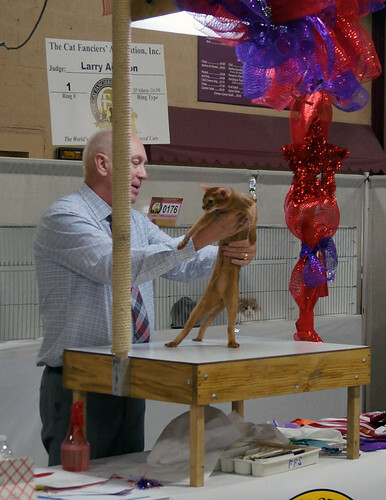 Deja Vu was the Best Aby Kitten in the Red show with 4 finals. Vasil’s fawn girl, GC Childofsun Nammi of Greenville, was entered in the Purple Show. 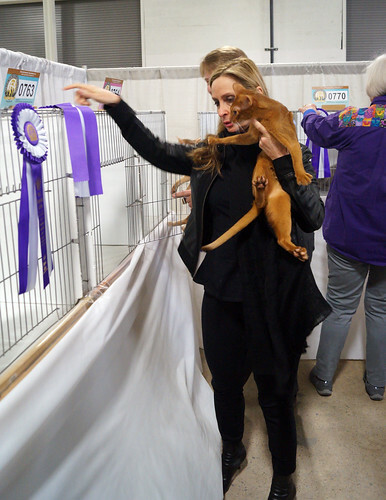 She didn’t earn a breed win, but she was a ONE-SHOW GRAND, maiking seven Championship finals and earing 245 grand points! Vasil and his girls weren’t the only breeders to bring cats from Russia. 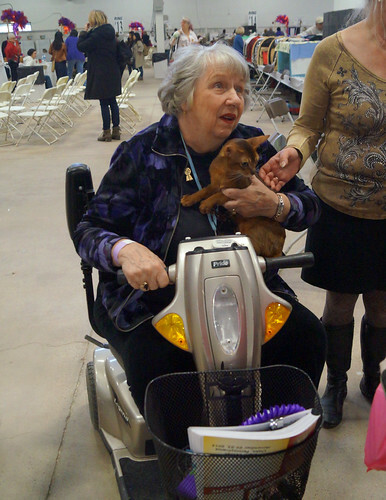 Here is Olga Beresneva with her ruddy Aby boy, GC Instincts Espresso of Omnia Mea. 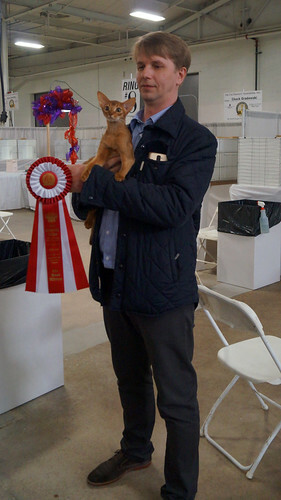 Espresso was the Second Best Aby Champion in the Red Show. 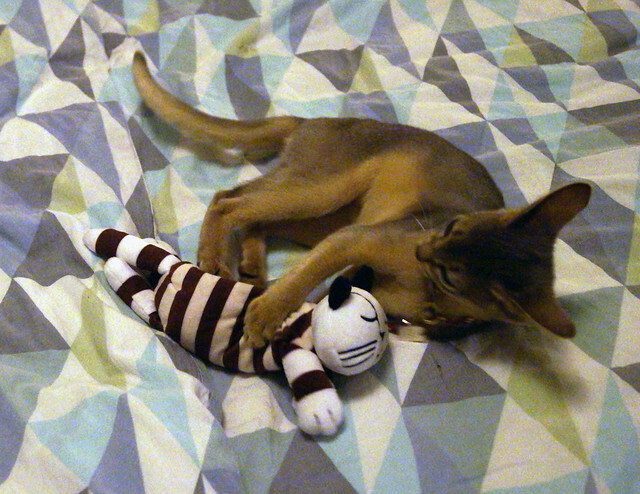 He’s also a cousin of Jake’s, since he’s from the same cattery, Instincts, as Jake’s mother Santa Catalina. 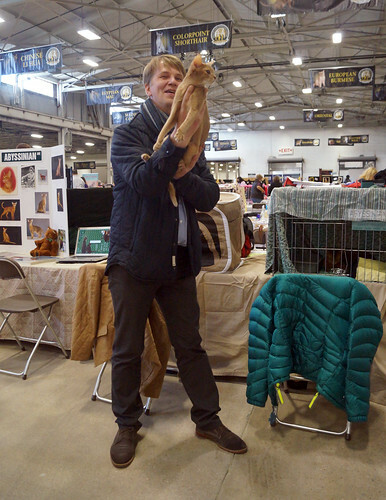 There were also several Aby breeders from Japan, although they didn’t bring their cats (Japan, being an island, would impose a 180-day quarantine on them when they returned). This is Kiyomi Kondo talking to Jake. We actually had dinner with the Japanese breeders, and they all gave me their cards. 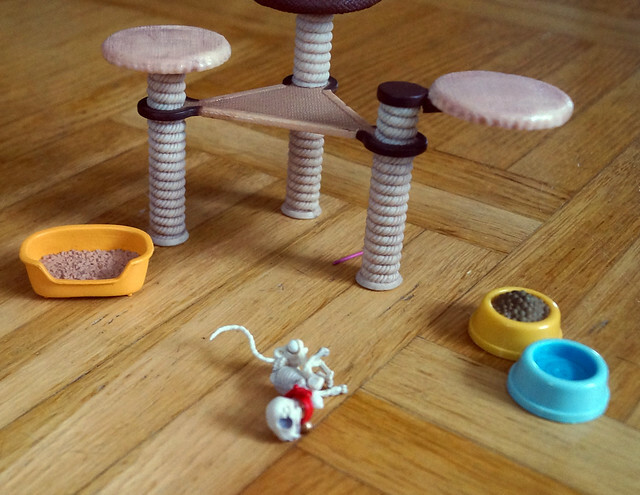 While the Japanese breeders couldn’t easily bring their cats, they did bring cat toys! 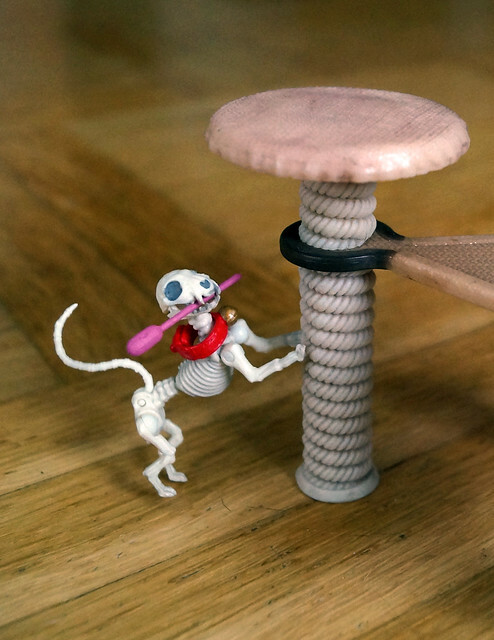 This is a stick toy that Jake was given. I think the cartoon kitty on the packaging is supposed to make you think of Chi. It was wonderful to meet so many Aby breeders from all over the world, but it was also great to see American breeders, too. 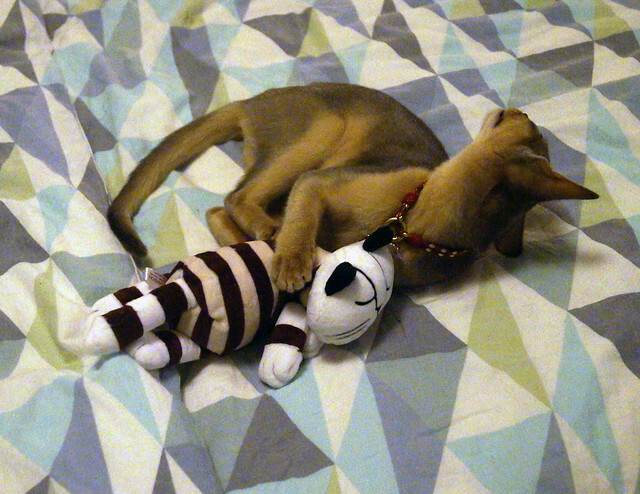 Of course, Meg and GP Anubis Chai Latte (aka Garçon) were there. Garçon was entered in the Purple Show, and he was the Best Aby in Premiership. Lauren Castle Flynn of Abycastle was there with her red boy, GC Abycastle Kathmandu. I also got to meet Suzie Kidder, a breeder who lives in Northern California but who grew up in Massachusetts! we actually had an interesting conversation about how we’d traded places. Here she is talking to spectators with her Open Champion Abyko’s Sparks Upon The Wind. 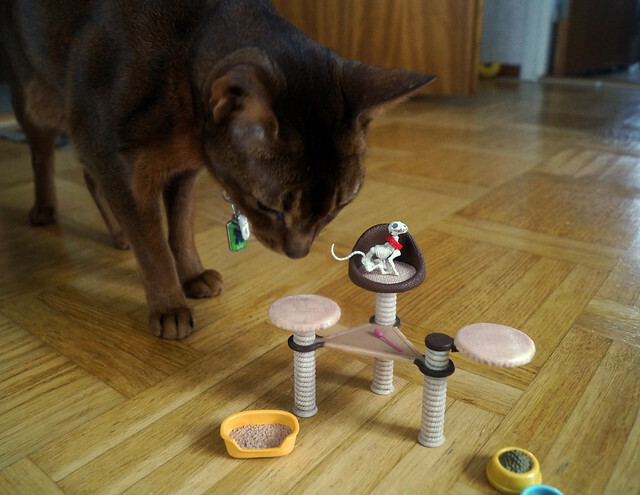 Suzie’s cattery, Abyko, is in Mill Valley. 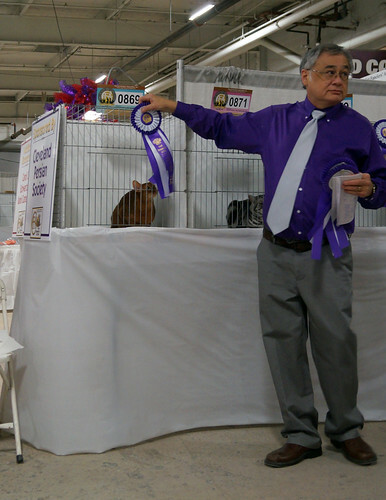 Carolyn Osier and her Aby GC Wil-o-glen’s Si Se Puede, from Orange County in Southern California, were also entered in the Purple Show. Si Se Puede had a great time riding on Susan’s scooter to get to and from the rings. 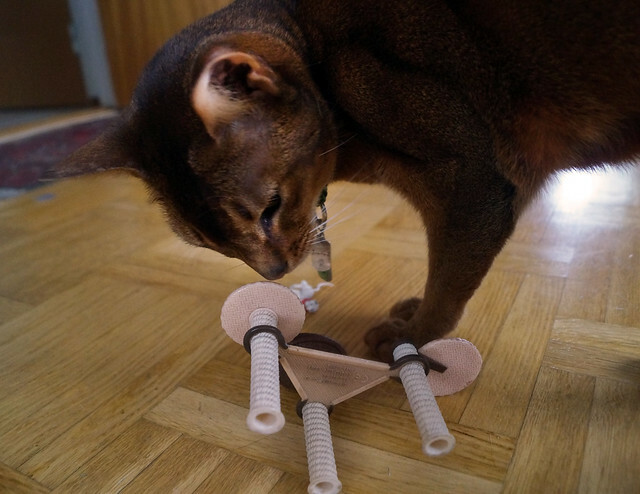 Wil-o-glen is one of those cattery names that appears in most modern Abyssinians’ pedigrees. Carolyn has been breeding since the late 1960’s, and even had an Aby who screen-tested for Disney’s The Cat From Outer Space! In fact, that Aby, GC Ruddy Raider of Wil-o-glen, appears in Jake’s pedigree along with several other Wil-o-glen cats on his mother’s side. 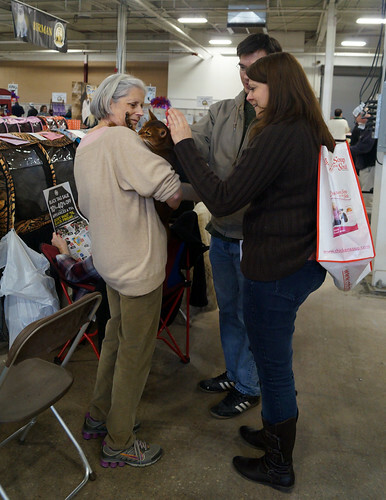 One of the highlights of the weekend, however, was meeting Rae Ann Christ of El Qahira Abyssininans. She took one look at Jake and knew that he was descended from her lines – he has several El Qahira cats in his ancestry on both his mother and his father’s side of the family! In fact, El Qahira is a name that shows up a LOT in Jake’s pedigree, as recently as his great grandfather, El Qahira Tamas! 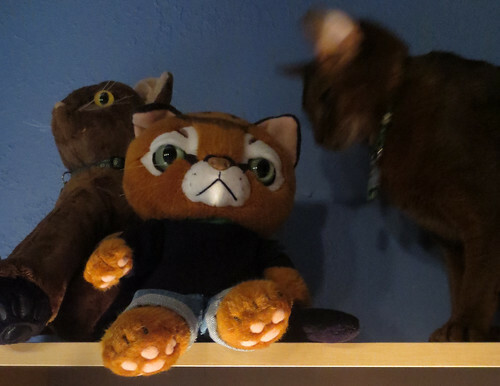 Don’t ask me how, but I happened to find this little Japanese treasure on eBay: 2003 Hello Kitty Cat Collection Abyssinian plush doll! Yes, you read that right. 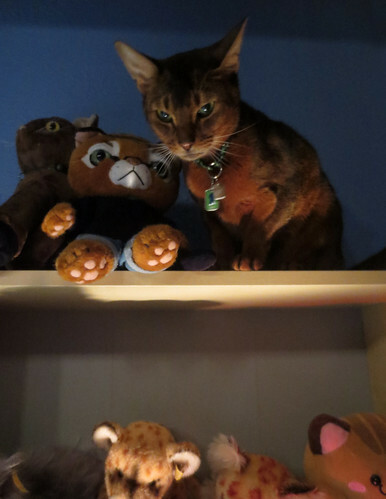 It’s Hello Kitty dressed up as an Abyssinian. Seriously. Hello Kitty. 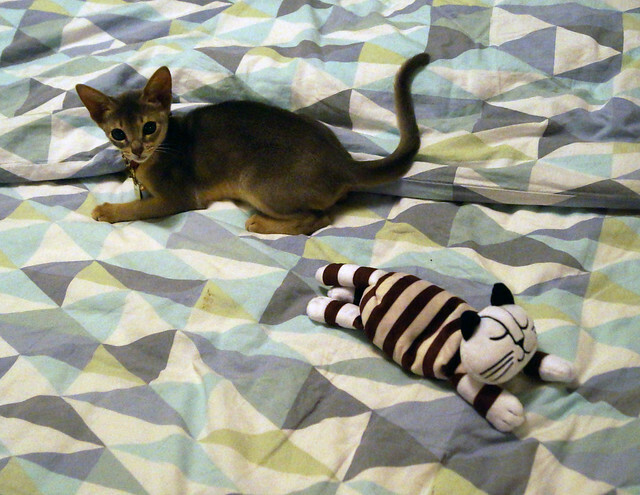 Dressed as an Abyssinian. She comes in several other breeds, too. With a little help from Google, it looks like there’s a Scottish Fold (スコティッシュフォールド), American Shorthair (アメリカンショートヘア), Russian Blue (purple?) 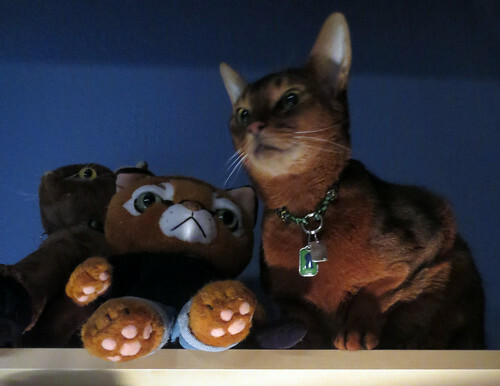 (ロシアンブルー), Bengal (ベンガル), Bombay (ボンベイ), Siamese (シャム), and a Himalayan (ヒマラヤ) on there. I’m not sure what the tabby and white one is meant to be, but 日本 I think means Japan, so it may just be a “regular cat.” This does align with Japan’s favourite cat breeds, more or less. And I’m not 100% certain, but I think this one (second from the left on the top) just might be a Somali…ソマリ is Somali according to Google Translate, and I think I see some of those characters there…anyone out there read Japanese? And yes, this is indeed meant to be an Aby. 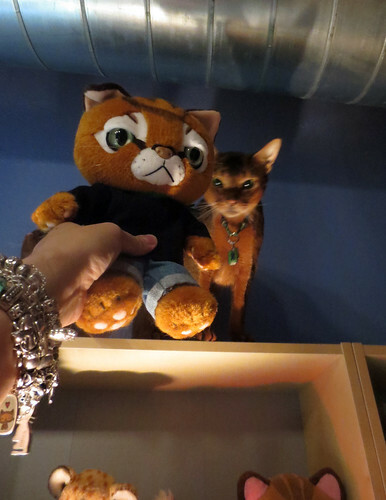 It says “アビシニアン” on the box, and that’s the Katekana for Abyssinian. That one I know! 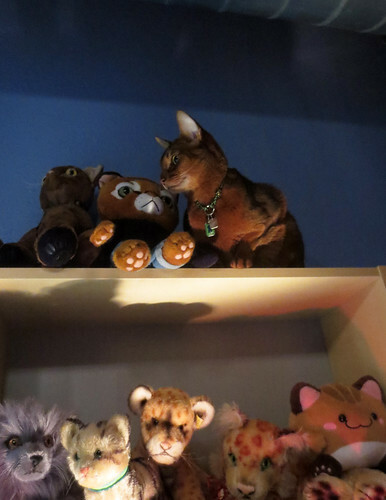 *Sigh* I would absolutely love to add this to my Aby collection…but at $80 USD (plus $35 for shipping), I’m going to have to content myself with the photos and the knowledge that it exists. This is so sad and so unfair. 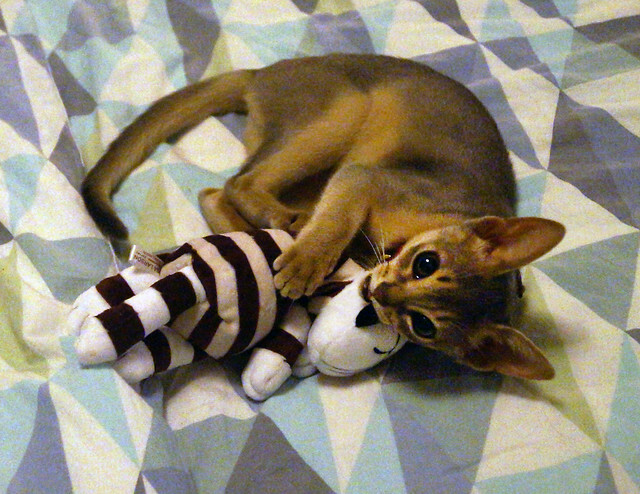 I cried out when I read this on Catsparella today, but Wasabi-Chan, the cutest kitten in the world joined StarClan much too soon today at 6:30pm Tokyo time. 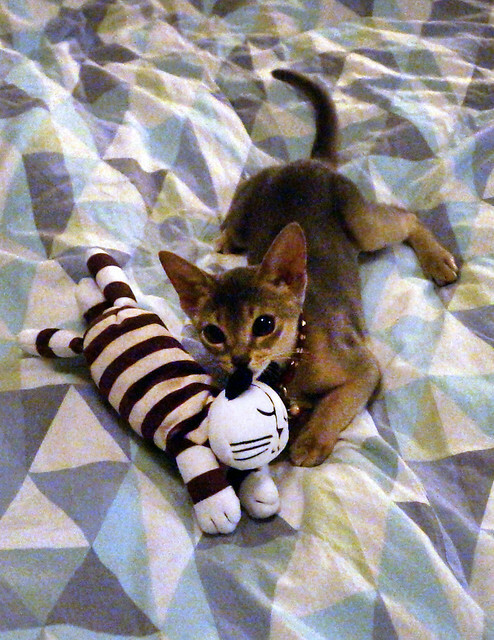 I know she probably wasn’t really an Aby…but she certainly looks like one. My heart is with the Thousand – again – because another friend stopped running today.